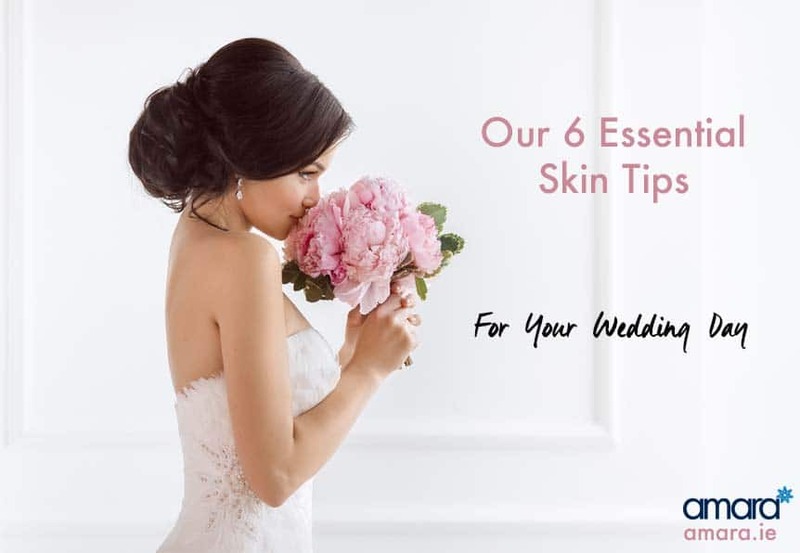 Planning a wedding is stressful enough without worrying about your skin. Your wedding photos will last a lifetime and though many brides create a workout/ body plan many of them neglect their skin. Here are our top tips for brides before your big day. There is no such thing as too early when it comes to your skin. Bride or not your skin is the largest organ in your body and the first thing you should be looking after. Starting your skin regime as early as possible will give you more time to get your skin to where it needs to be. Ideally, the latest you would start would be 6 months before the big day. 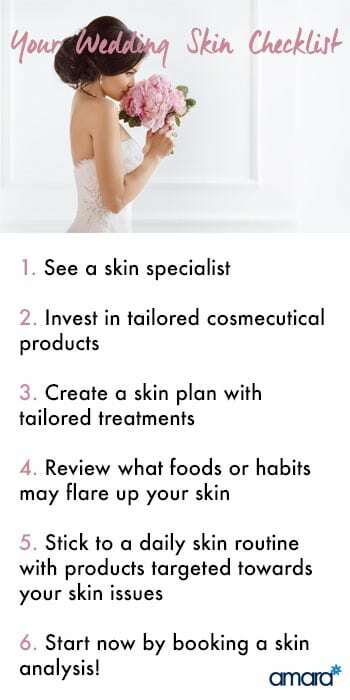 Before you do anything to your skin it’s important to see a Skin Health Specialist who can give you a full skin analysis of exactly what your skin needs by going through every step of your daily routine. They will advise on what at home products and in clinic treatment would give you the best results. Know what your skin issues are. You know your skin, you may just not know what it needs. Your skin specialist will treat your skin depending on your skin condition such as Acne, pigmentation, dull skin, rough skin, loose skin etc. Typically a mix of in-clinic treatments and at home tailored, cosmeceutical products are ideal. The aim would be to treat any active conditions you have and then maintain your results. Typically the most popular treatments for brides a course of HydraFacials, this treats congested, rough, dehydrated skin and well as early lines and wrinkles. The HydraFacial also leaves your skin with a dewy glow – perfect for any bride on their big day. Treatment such as the HydraFacialMD is tailored depending on what your skin needs for example if you have typically congested or oily skin a higher strength salicylic peel will be included as well as Blue LED light therapy to kill bacteria. Other treatments such as the Rejuvapen or Exilis Elite skin tightening work perfectly with the Hydrafacial to clear and tighten your skin. How many times have you bought a 3 step routine from a chemist only to half use it? Sticking to your at home tailored routine is just as if not more important than your in clinic appointments. Think of your in clinic appointments like a personal trainer, your personal trainer gave you a meal plan to follow – if you don’t stick to your meal plan then your results from the training won’t be as good. It’s that simple. On average your skin routine will take about 4 minutes (if even). Always start with your targeted cleanser and wash for 60 seconds with lukewarm water – this ensures all your makeup is removed letting your pores breathe, it also helps with activating your skin in the morning getting it ready for the day. Next, we follow with your serum, replacing moisture this add peptides and ingredients such as retinol to the skin – protecting and treating your skin. The final step of your routine is to always have SPF in the morning. This prevents your skin from ageing from the sun’s UV rays ( even if you can’t see it). It also helps prevent any scars or pigmentation from darkening making them more noticeable. SPF also helps stop premature ageing from the Blue light from computers and phones. If you work at a computer every day then SPF is essential. If you already have a wedding date picked chances are you have a wedding diet in mind. Depending on your skin you may be missing essential nutrients which can help your skin. At your first skin analysis, your skin specialist will aim to dissect your routine and what could be causing your skin issues i.e many people get breakouts or inflammation from milk or soya. Cutting out harmful foods and adding essential nutrients will help your skin glow and avoid irritating conditions. For example, if you are prone to cold sores lysines could be added to your diet to help prevent them, with active cold sores avoid eating peanuts and some sugars as they will slow down healing time. Whenever your wedding the earlier you start the better. Contact us now to arrange your Skin Analysis and start your regime today.